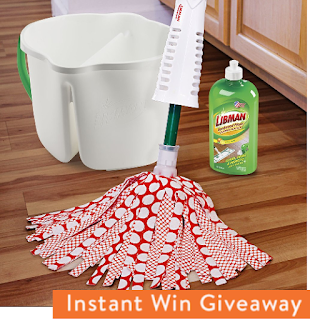 Libman Wonder Mop Instant Win Giveaway - 92 Winners win a Libman Wonder Mop, 6 Grand Prize Libman Cleaning Prize Pack. Daily Entry, Ends 8/31/18. GOOD LUCK!! PRIZES: Libman will award 86 standard winners and 6 grand prize winners. Each of the 86 standard winners will win a Libman Wonder Mop (#2000). Approximate Retail Value of a Libman Wonder Mop is $12.99. Each of the 6 grand prize winners will be awarded a Move-In Cleaning Kit. The Move-in Cleaning Kit consist of the following products: Precision Angle Broom & Dust Pan (#206), Freedom Spray Mop (#4002), All Purpose Sponge (#1076), Microfiber Cloth (#236), Easy Grip Scrub Brush (#16), Tub & Tile Scrub Brush (#1161), Bowl Brush (#34) and All Purpose Latex Rubber Gloves (#1321). Approximate Retail Value of Move-In Kit is $68.22.